And of course, they can't get a tech out to me until Saturday. So that put a damper on getting anything accomplished last night. It's alarming how much I've come to depend on the internet. And it's only made worse by the fact that I dropped my phone last week, and not only did it crack the screen, but it apparently damaged it's operation as well, because it closes out of any app etc. that I open. It's been a frustrating week. In any case, welcome to this week's edition of Frugal Friday. I'm just sharing one post for this week's Frugal Round-up because well, my internet is broken. Lol! 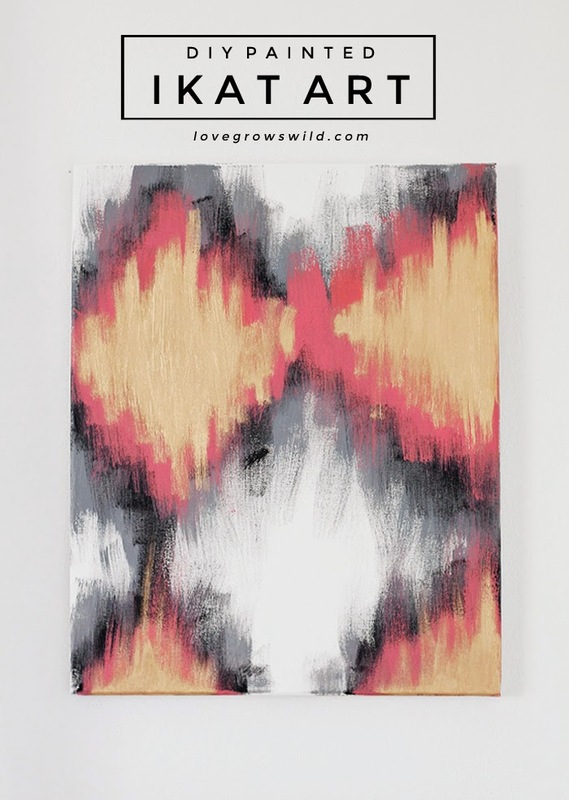 I thought this tutorial on DIY painted Ikat art from Love Grows Wild was really fun! Check it out! Sorry to hear of your technically problems, it really does make you wonder how we managed before the internet, it has so quickly become such an integral part of our lives. Scary! Fingers crossed you are all sorted soon. Thanks for hosting despite your Internet problems! Not having internet is really frustrating! Good luck getting it working, and your phone too! No internet and no phone... ugh! I hope it gets resolved quickly for you. Thanks for hosting the linky anyway.